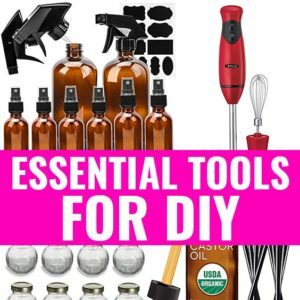 Get Luscious Locks: Banana Olive Oil Hair Mask for Damaged Hair - beautymunsta - free natural beauty hacks and more! This Banana Olive Oil Hair Mask for Damaged Hair adds life to dull and tired locks, giving them a healthy sheen! Damaged hair from use of hair tools, sun exposure, chemicals and chlorine can be restored back to health using this very simple banana and olive oil hair mask. The humble banana contains healthy nutrients and moisture that can feed and water dry damaged hair back to its former luster and olive oil is an excellent conditioner that brings the shine back into dull damaged locks. 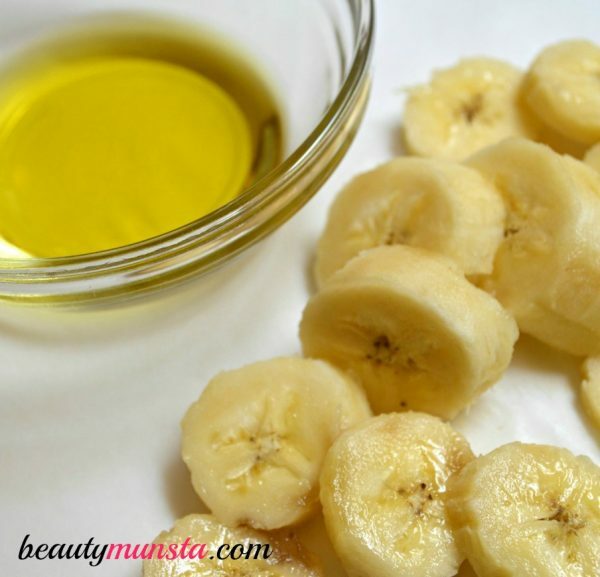 It’s simple really, you only need banana and olive oil to make this amazing hair mask for damaged locks. It’s important to combine the ingredients thoroughly for best results. The banana should be blended into a smooth puree with no lumps. Use this hair mask once a week to restore damaged hair back to its former luster. 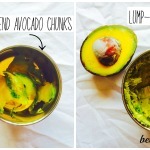 You can store excess hair mask for up to a week in the refrigerator, but if its starts smelling funky, throw it away. This measurement is for shoulder length hair. Feel free to add on or reduce the quantities of ingredients according to your hair length and thickness. Banana – Rich in potassium for strengthening dull locks, nourishing hair roots and maintaining healthy pH balance. Has 75 per cent water for revitalizing dry damaged hair locks. Contains tryptophan, an amino acid that keeps hair healthy and strong. Excellent moisturizer that can help damaged hair restore its natural moisture levels. Olive oil – Rich in vitamin E and healthy fat, olive oil gives damaged hair a natural sheen. Conditions and softens brittle damaged hair. Promotes hair growth and heals split ends. 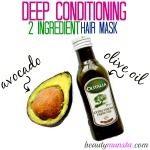 Gather the ingredients needed for this hair mask. Using a blender, puree 1 ripe banana until you get a lump free banana smoothie. In a small bowl, stir in the olive oil to the puree until you form a paste. 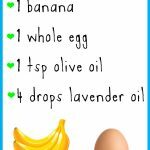 Your banana and olive oil hair mask is ready! Your final mixture should be smooth and absolutely lump free. 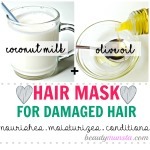 Feel free to add a little water or milk to make the hair mask easier to apply. I added 1 tablespoon of milk. First wet your hair so that it is easier to apply the mask to your hair. Cover your hair with a warm towel and sit for at least 2 minutes. The warmth will open up your hair follicles so that the mask can penetrate deep into your scalp. After 2 minutes, unwrap the towel and separate your hair into 3 partitions. 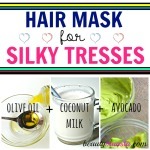 Apply the mask to your hair starting from the hair roots to the ends. Massage the mask onto your scalp in gentle circular motions. Slather a generous amount on the hair ends where the most damage occurs. Wind your hair into a loose bun and cover with a shower cap or even plastic bag to prevent the hair mask from dripping and creating a mess. Sit for at least 10 minutes to let the goodness of the hair mask sink deep. You can use this time to relax by reading a book or even do something productive like getting lunch ready. When the time is up, gently rinse your hair with tepid water first and finish off with a cold water rinse to close open pores. After the final rinse, shampoo and condition your hair as usual. After using this hair mask, there’s no need to shampoo as your hair will be cleansed and smell normal…ok, a bit like bananas but that’s not a bad thing, is it? 😉 If you really feel you need to shampoo, use an organic and natural shampoo to prevent putting chemicals on your hair after an all natural hair mask. Kind of defeats the purpose of being natural, you know? Olive oil is a great conditioner itself, so even using a conditioner can be forgone. 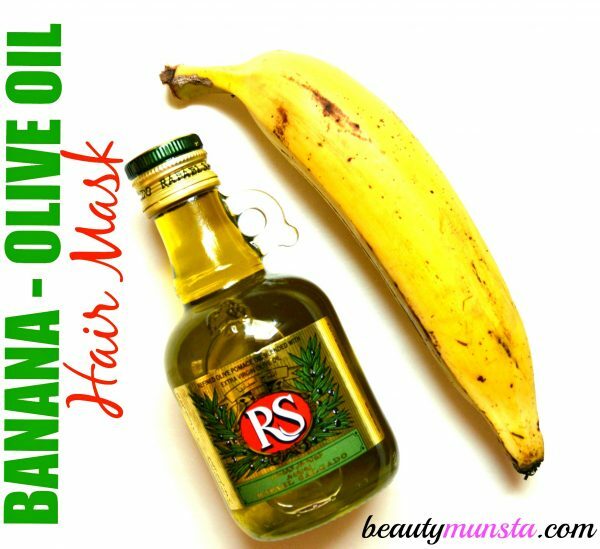 Best use this banana and olive oil hair mask before a shower so that you can easily remove it off. It can be sticky and hard to rinse off. Apply the hair mask over your bathroom sink because it can create a drippy mess on the floor. 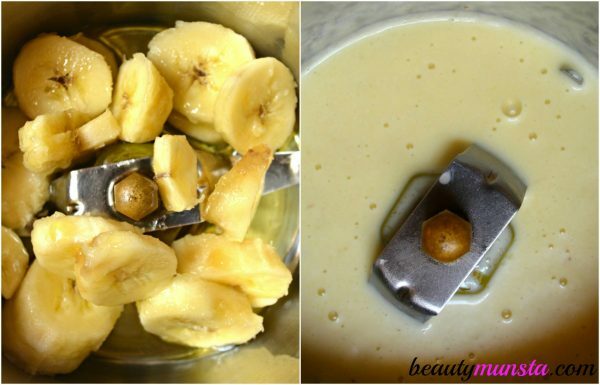 Blend your banana smoothly so it’s absolutely lump free. If the mask is lumpy, it will be hard to wash off. You don’t want to have small bits of banana stuck to your hair all day! If you are going chemical-free on your hair, but want to save the time of making a homemade shampoo, this Maple Holistics Sage Shampoo is a game-changer. It contains powerful herbs such as sage: for dandruff & itchy scalp treatment, rosemary: for hair growth and prevention of hair loss and spikenard for dandruff treatment. It also has argan, jojoba and tea tree oils that all protect the scalp from germs, keep hair clean as well as hydrated and moisturized. This shampoo does not contain sulfates, so it will not lather the way you are used to, but you will quickly get used to it and notice the difference!